BEIJING (AP) — The Pentagon criticized what it called China's "continued militarization" of island outposts in the disputed South China Sea, where the Chinese air force landed long-range bombers for the first time, putting entire Southeast Asia within their range. 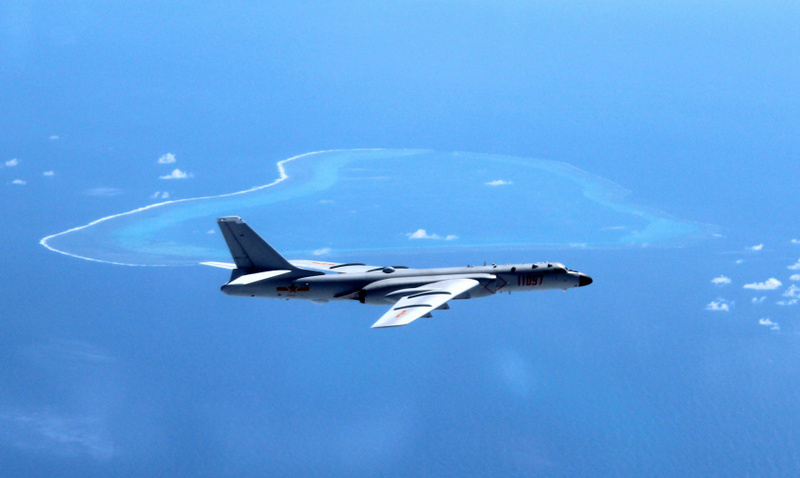 The China Daily newspaper reported Saturday that the People's Liberation Army Air Force conducted takeoff and landing training with the H-6K bomber in the South China Sea. China is pitted against smaller neighbors in multiple disputes over islands, coral reefs and lagoons in waters crucial for global commerce and rich in fish and potential oil and gas reserves. A statement from the Defense Ministry late Friday said the exercise was conducted on an island reef, but it did not specify when or where, saying only that it took place recently at a "southern sea area." It involved several H-6Ks taking off from an air base and making a simulated strike against sea targets before landing, the ministry said. Wang Mingliang, a military expert, was quoted in the statement as saying that the exercises will help the air force improve its "real combat ability against all kinds of marine security threats." The U.S., which doesn't have any territorial claims but insists on freedom of navigation and a peaceful resolution of the disputes without coercion or threat of force, criticized the move. "The United States remains committed to a free and open Indo-Pacific," a Pentagon spokesman, Marine Lt. Col. Christopher Logan, said in an email. "We have seen these same reports and China's continued militarization of disputed features in the South China Sea only serves to raise tensions and destabilize the region." The Washington-based Asia Maritime Transparency Initiative, using Chinese social media posts, identified the location of the exercise as Woody Island, China's largest base in the Paracel Islands that are also claimed by Vietnam and Taiwan. The U.S. and others accuse Beijing of militarizing the region to bolster its claims. Washington has said it violates a pledge by President Xi Jinping to former President Barack Obama not to militarize the area. China says it has a legitimate right to build up defenses on the islands. Adm. Phil Davidson, the new head of the Pacific Command, said recently that China had reached the tipping point in its control over the South China Sea. Beijing's island bases can be used to challenge the U.S. presence in the region, "and any forces deployed to the islands would easily overwhelm the military forces of any other South China Sea-claimants," Davidson wrote in recent testimony to Congress.